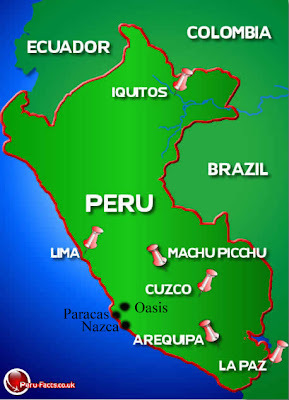 Peru is the last stop on my Latin adventure. I spent a whole month traveling a loop in the southern part of Peru and by the end I had slept 32 places since I started (not including over night buses) and have met people from 26 different countries. I only count people I’ve exchanged emails with and will exchange photos with in the future. To give an idea of where the places I talk about are. I flew into Lima from Bogota March 7th. When I arrived in Lima I wanted to avoid the overpriced taxis and walked right by the taxi booth. But I got duped when a guy in average clothes (expensive taxis they are all dressed up), and figured he was the medium taxi man (the street taxis are the cheapest and most dangerous since there is a major problem with kidnappings in Peru by taxis right now). This average looking man worked for the expensive company and I found myself in a posh car, an automatic with leather seats, cursing myself for not just saying “hell no!” and walking away. Then the guy gave me a lecture on my location. “It’s so dangerous! Why don’t you go to Mira Flores where everyone goes?” In Spanish of course, but it annoyed me. I hate that it’s assumed I want to do what everyone wants to do. They guy just wanted to take me to his hostel, where he gets paid to take me. He then got good and lost in the central area for a good half hour. He was asking for directions with the wrong questions! I figured out where we were before he did because I was actually using the map he refused to look at. My hostel is a gorgeous old building with tall ceilings, old paintings I was trying to figure out if they were authentic, a thousand remakes of the sculpture David, and a few authentic skulls in a glass case. It was four or five floors high, I think, it was like a maze of stairs after the third floor which was also a terrace. I immediately met a guy who volunteered his free time to the hostel: Carlos and his nephew Sergei (he’s Peruvian with a Russian name). They were on their way to go surfing with Julie from Denmark so I join them. My first time surfing! I caught one good wave by accident and didn’t stand because it was so much fun to just ride it on my belly… but didn’t realize it was going to be the last one. The ocean was disgusting! There were many things floating in it, but there were many surfers with us ignoring the waste so we did too. We surfed past sunset before heading back. The turtles at the hostel, there were parrots and a few cats too. Later that night I found Julie sitting on the terrace with two other folks from Denmark. I joined them and became immediate friends. Ingunn and Jacob were heading to the same places as me so we decided to join forces and provide each other company for a while. They were so much fun! Ingunn has this amazing energy about her that makes me laugh and giggle like a school girl all the time. We went to Paracas and saw “poor man’s Galapagos islands” which was just a lot of penguins, sea lines, and boobies (those are birds for you folks who just snickered). We went to a national park of desert and picked up loads of shells, saw the damage of the earthquake the struck two years ago, and tried to identify day old carcasses along the ocean… and their cause of death since there were so many dead things. We then went to this oasis in the desert and stayed for days after discovering we were addicted to sand boarding. In the national park of desert, Paracas, Peru with Ingunn and Jacob. Sandboarding is basically snowboarding on sand, you can use the same board if you want, but I liked the ones you strapped into with Velcro. I tried standing a few times but it isn’t as much fun as laying down on your stomach and plummeting head first down these massively tall and steep sand dunes. I didn’t mention we took crazy buggies across the desert to get to these dunes and it’s awesome going up and down and taking big turns and being surprised the driver manages to avoid flipping the buggy. We went three days in a row, usually racing each other to see how far we can go, but Ingunn being tiny always won. You go so fast if you don’t keep your appendages in you loose some skin on the sand. Some people decided to stand on a lot of the tall dunes which I wrote off as incredibly stupid… especially when they ALL wiped out at some point. Many weeks later I met a guy who had just come from the sand dunes and a guy had died sandboarding, he fell, probably broke his neck, and no one took him to the hospital for a half hour and he died on the way. Jumping off our sand buggy! While we were in the desert we saw the Nazca lines and went to museums were there were mummies. We made friends with local artisans and bought their work and shared a beer. I became friends with the stray dogs, they liked me because I always saved my food for them. Our hostel had parrots that joined us on our tables for breakfast and ate our food… one kept drinking my coffee when I wasn’t looking. They liked when you played rough with them, pulling on their beak and such, and I would play with those parrots for hours! pregnant female mummy, legend has it she wasn't supposed to be pregnant, and was killed and stuffed in an earn and buried. Glad that's the not custom today if you accidentally get knocked up. 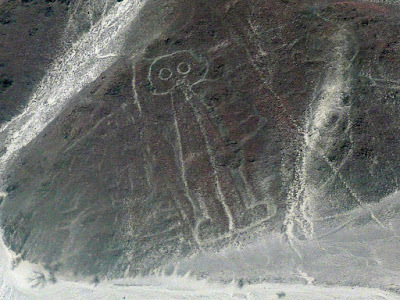 The space man, my favorite of the Nazca lines because it really does look like an alien. Your friend Ingunn is hot!